Growing giant Himalayan lilies (Cardiocrinum giganteum) is an interesting task for the gardener who loves lilies. Giant lily plant facts indicate this plant is large and showy. As icing on the proverbial cake, blooms offer an enticing fragrance when in bloom, especially in the evening. Blooms of the Cardiocrinum Himalayan lily are large, nodding, trumpet shaped and a creamy white color with reddish-purple centers. As the name indicates, this is a large lily, reaching 6 to 8 feet in height. Some giant lily plant facts say this lily can reach 14 feet. It is hardy in USDA Zones 7-9. Giant Himalayan lily care includes planting bulbs in a partially shaded location. You will learn that this plant is something of a late bloomer. In fact, when growing giant Himalayan lilies, don’t expect blooms until the fourth to seventh year. 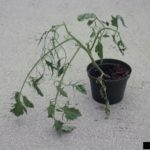 Many of the plants that are for sale on the web are already a few years old. Plant the bulbs shallowly in rich soil that can remain moist. Giant lily plant is an attractive addition to shady, dappled areas of naturalized woodland gardens. You’ll want to plant it in a convenient location to keep a close eye on it as the lily grows. As with most worthwhile efforts, some difficulty exists when caring for this plant. Giant lily plant facts label the specimen as high maintenance. Slugs, snails and aphids (which can carry lily mosaic virus) are often attracted to the Cardiocrinum Himalayan lily. After you’ve been diligent about pest control and learned exactly how to grow Himalayan giant lilies, you’ll get a bloom between June and August of the fourth to seventh year. Large, showy and fragrant, the blooms of Cardiocrinum Himalayan lily drain all the energy from the bulb. The plant dies, leaving behind ornamental pods of fruit. Fortunately, for those who wish to continue growing the Cardiocrinum Himalayan lily, numerous offsets develop from the parent bulb. Replant these, follow the instructions above and you’ll have more blooms from the Cardiocrinum Himalayan lily in future years. Once you’ve started growing this plant, you can coordinate your efforts so that you have blooms every year. Read more articles about Himalayan Lily.